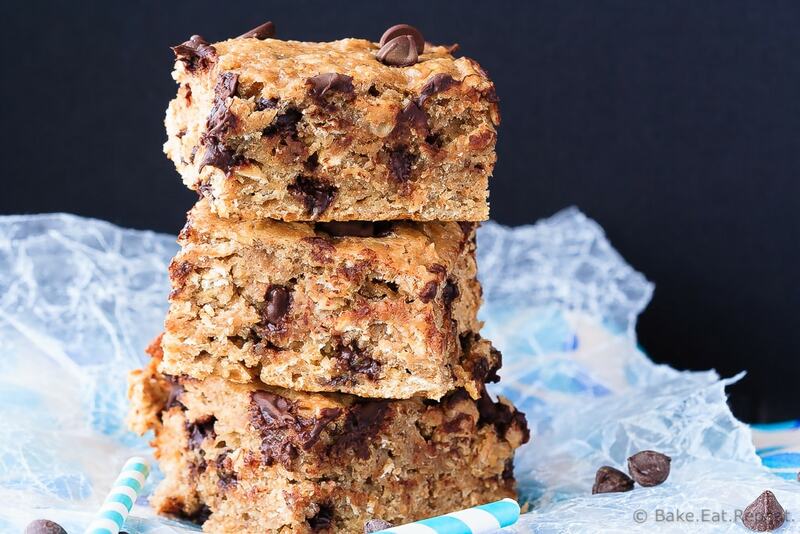 Peanut Butter Banana Oatmeal Bars - Bake.Eat.Repeat. 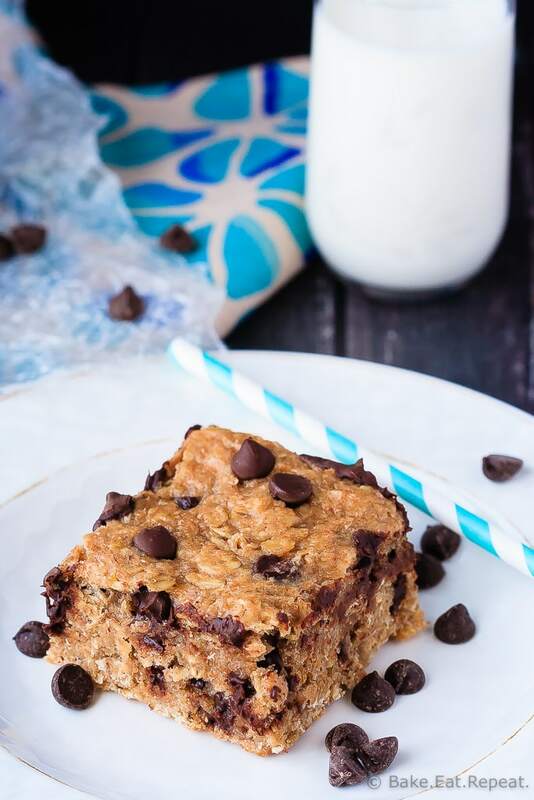 Quick and easy to make, these peanut butter banana oatmeal bars mix up in minutes and are healthy enough for an on-the-go breakfast or snack! How I love fast and easy snacks that can double as breakfast. Especially when chocolate and peanut butter are involved. Peanut butter banana oatmeal bars. With chocolate chips! And they’re healthy! And yes, I have yet another oatmeal bar type breakfast/snack recipe for you today. Because they’re awesome. And oatmeal is good for you. But I can’t eat it in a bowl like a normal person, so I need to keep making different oatmeal bars instead. I’ve got a few different versions of this recipe now. The first one I made was these banana oatmeal squares, and I think those are still the favourite. But these apple oatmeal squares definitely run a close second. And then there was this banana berry oatmeal cake which also started with the same recipe. Clearly I can’t get enough of baked oatmeal things. It’s just such a great on-the-go breakfast or snack! Healthy, filling, and so fast and easy to make that it’s kind of hard to beat. Plus they’re all great either cold or warmed up and they all freeze beautifully. 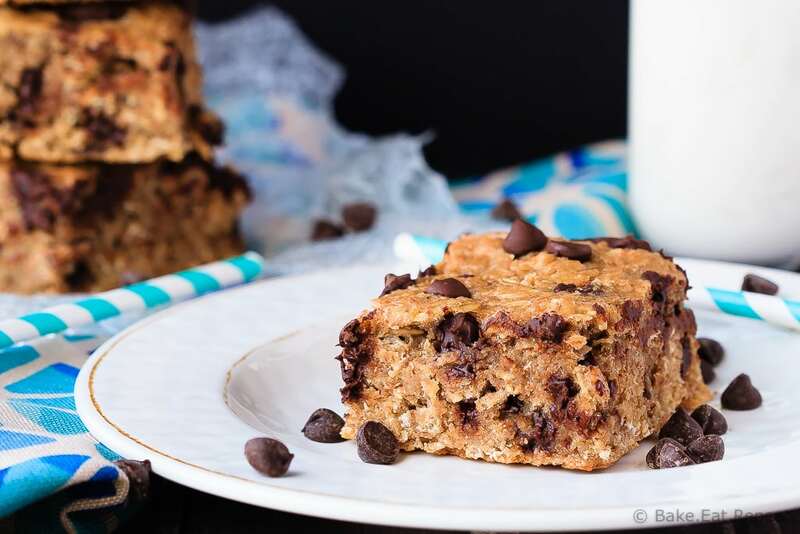 These peanut butter banana oatmeal bars may just be the new favourites around here though. Possibly because I added chocolate chips to these ones. Maybe. Makes it a little more treat-like but they’re still definitely healthy enough for breakfast. And I love when I can include chocolate in a healthy snack and not feel guilty about it! These peanut butter banana oatmeal bars have no refined sugar, no butter or oil, and use only whole grains. They’re filled with banana and peanut butter flavour, and the oats make them nice and hearty. They are the perfect breakfast or snack and will keep you going, while feeling like a treat because of the chocolate chips. We loved these. I don’t think my oatmeal bar obsession will be ending anytime soon. I’ve also shared this Peanut Butter Banana Oatmeal Bars recipe over on Food Fanatic. These are so great because they're wholesome and healthier but taste like a treat I'm sure! I love that there's so little sweetener here -- I'm sure the bananas did a great job sweetening them up on their own. I can't wait to try these! These remind me of one of our favorite baked oatmeals -- my kids would LOVE these, especially for breakfast! Or snack, or dessert, or really any time of day! Oatmeal snack bars are my kiddos favourite! Peanut butter + chocolate + banana is such a yummy combo and I love that these are healthy! My kids favourite thing too. When PB and chocolate is involved they may also be my favourite thing! :) Thanks Kelly! I love a filling afternoon snack that also involves PB and chocolate chips. It hits all the happy flavors while still providing some hearty filling-ness. I'm excited to try these! I looooove snacky oatmeal bars like this one! And I mean, peanut butter, banana, chocolate, AND oats all hanging out in one bar just sounds like an overall win to me! Why have I never made oatmeal bars before?! These look amazing, Stacey! I'm pretty sure I would eat these all in no time. Love the mashup of peanut butter and banana!